Rift is getting a big update in the form of triple faction battleground combat, with three sides duking it out across an new version of the Stillmoor area, reclassified as a PvP warzone and letting players fight over the new ‘Sourcestone Extractors’. Or as you and me might know them, control points. It’s a big shift for Rift, which has previously been a very PvE focused game, but if you’re going to do PvP, a three way is always the best way. Ahem. The revamped Stillmoor area is now home to a set of these Sourcestone Extractor control points, each of which, when held, grants benefits to your team in the form of buffs and resources, and the game is going to be tracking your contribution to the three-faction warfare, giving you an additional set of buffs and resources on top of that. The idea is to keep you interested outside of the PvP just as much as you are inside, which makes you play all the more. Smart. Trion,in a postabout the game mode, state that victory occurs when either 40% of the control points are in one faction’s hands, or 5000 players have been slain on the battlefield. It won’t be an abrupt end, as a ten minute timer starts to tick the instant either of those are triggered. With three factions, the idea that 40% control would be difficult makes it sound like there are going to be a hell of a lot of these control points, making defending andattacking them at the same time a tricky proposition. 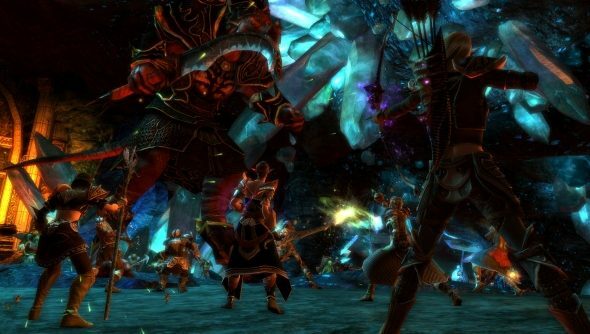 It’s not the first time an MMO has done three way PvP, and it’s not going to be the last, either; the upcoming Guild Wars 2 is championing the idea of having a huge area for three different server shards to duke it out, over a two week period. And there’s Dark Age of Camelot, which was entirely focused around the balance of power between the game’s three factions. Or there’s Planetside. The reason it works so well is that it negates the chance of one side ever becoming too strong, as the instant there’s a clear leader it only makes sense for the other two to gang up on them. This stops the kind of horrific, frustrating, unsatisfying steam-roller from occurring, which happens far too often in far too many games. Losing without hope of victory is never fun, but even if you’re clearly outmatched against one side, through sheer force of numbers two sides can probably outgun one superior force. That’s the idea, anyway. The Three-Faction Update is already on the Rift test servers, which means it’s likely going to show up on the official servers sooner rather than later, after which you can die a thousand pointless deaths on a thousand different battlefields, all in the name of whichever faction you choose to align yourself with. The important thing is that you have fun.